President Trump speaks to Venezuelan Americans in Miami Monday, denouncing the Maduro government and military members who support it. 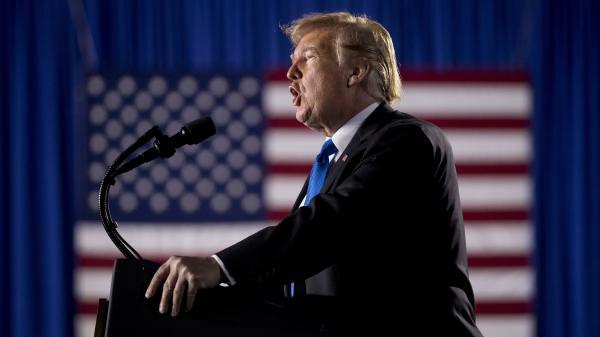 Trump cautioned that time is running out for Maduro and that those who have been slow to embrace the opposition leader, whom the U.S. recognized as that nation's legitimate president last month, are confronted with a perilous choice as the world watches. Trump specifically addressed the military, saying that backing Guaidó would lead to "a safe and prosperous future for all of the people of Venezuela." But continuing to back Maduro, whom Trump called a "Cuban puppet," would lead to a world of personal suffering. "If you choose this path you will find no safe harbor, no easy exit and no way out. You will lose everything," Trump said to cheers from the crowd. "They are risking their lives and risking their future for a man controlled by the Cuban military." Trump accused Maduro and the handful of elites he said run the country of plundering the nation "into poverty and into death." And Trump railed against what he described as the "tyrannical socialist" governance that has brought the once-wealthy nation to the brink of ruin. He urged military leaders to turn away from socialism and toward democracy, reiterating Guaidó's promises of amnesty under which military leaders would be allowed to live life "in peace with your families and your countryman." "End this nightmare of poverty, hunger and death for your people," Trump pleaded, noting that the U.S. delivered a shipment of humanitarian assistance for Venezuela to Colombia over the weekend, including thousands of nutrition kits for children. As NPR has reported, U.S. officials have admitted the delivery is part of a sweeping effort in the past two weeks to amass such a vast supply of much-needed food and medicine just out of reach of the desperate population, that Venezuelan military officers will be forced to capitulate and defy Maduro by allowing aid to enter the country. So far, the Venezuelan president has refused to allow the foreign aid to cross the border, insisting it is "a Trojan horse" and "a precursor to an American invasion," NPR's Eyder Peralta told All Things Considered. The supplies remain stuck, blocked by Maduro's army at the Colombian-Venezuelan border. During the speech Trump said the U.S. seeks a peaceful transfer of power in Venezuela, but he added "all options are open." The spirited speech did not contain any specifics regarding imminent diplomatic or policy changes. But, in what's likely a field-test of some of Trump's 2020 re-election themes, the president continually bashed socialism in the swing state of Florida before an audience of Venezuelan exiles and Cuban-Americans. "The twilight hour of socialism has arrived," Trump said, adding that the 50 nations that have recognized Guaidó as the legitimate leader of Venezuela have a "shared interest in preventing the spread of "socialism." Trump also condemned the "ugly alliance" between the Cuban and Venezuelan governments, which he said propped one another up. "To those who would impose socialism on the U.S.," he said, "we again deliver a very simple message: America will never be a socialist country." Trump's speech came on the same day that Maduro's government expelled a group of European Union diplomats who planned to meet with Guaidó .